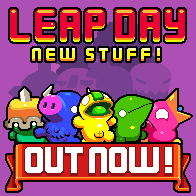 Leap Day Update 1 is now live! It contains 43 gifts for you to unlock for completing cups in Leap Day. So get it now and start collecting!